A 5 episode web docu series that take a look at Jamaican’s in the diaspora who are representing Jamaica to the fullest. Olympic Skier Errol Kerr speaks about his XGames Ski Cross career and what it was like to represent Jamaica in the 2010 Winter Olympics in Vancouver. Jamaican born Maryland based Country Music singer Dean Crawford as he speaks about his life, passions and music. Featuring former and first Jamaican Born NHL player Graeme Townshend. Grame speaks about his life, career, coaching, and building a Jamaican Olympic Ice Hockey Team. UFC Bantamweight Aljamain Sterling talks about his UFC career and what being Jamaican means to him. 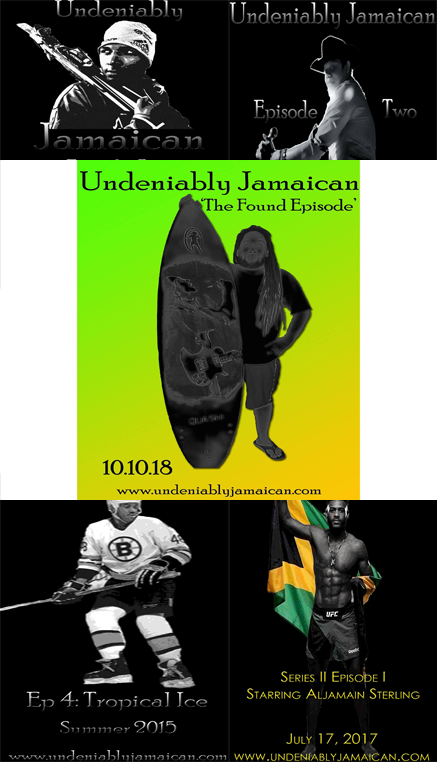 In the 'Found Episode' of Undeniably Jamaican I speak with Surfboard Maker Patrick 'Quashi' Mitchell about his company Quashi, the history of Jamaican Surfing and what he has been up to recently. Scroll down to watch each episode.